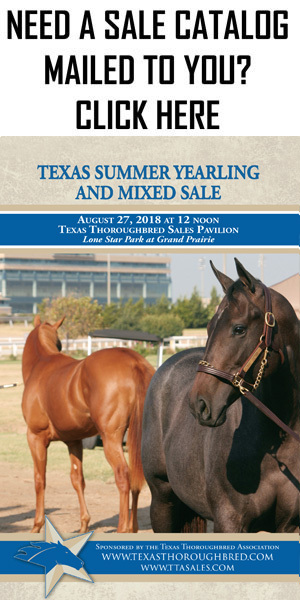 T he Texas Thoroughbred Association and Lone Star Park have announced a catalogue of 119 head for the upcoming Texas Summer Yearling and Mixed Sale. 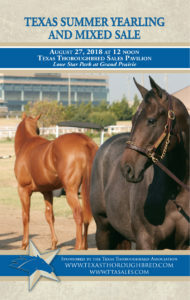 The auction will be held August 27 at 12 noon at the Texas Thoroughbred Sales Pavilion on the grounds of Lone Star Park. Other sale events include a pre-sale party on the night of August 26 and a seminar that morning with representatives from The Jockey Club and equineline.com explaining the new digital certificates for foal registration. The seminar will include a demonstration of the new process and a question and answer session, so the TTA encourages all horsemen to attend in order to better understand the upcoming changes. The catalogue includes 90 yearlings and 29 weanlings and broodmares. Many of the weanlings and broodmares are consigned by the Estate of Ed Few. The noted Texas breeder and owner passed away earlier this year. This entry was posted in Yearling Sale. Bookmark the permalink.